If you’re running a small business, you know how important it is that your employees are happy. The culture of a company can be the thing that brings it over the top or causes it to flounder. If your employees enjoy coming to work every day, then you’ll see productivity and teamwork flourish. But, if most of your employees dread showing up every morning, you can expect a lot of turnover and a lot of distress. So, how will you know how to improve company culture when it can be so hard to gauge? In this post, we’re going to show you seven ways in which you can identify problems and improve the culture at your company. Once you’ve implemented some of these steps, you’ll wonder why you hadn’t handled this problem earlier. When everyone’s happy and cooperative, there’s no limit to what you can accomplish. If you look around the corporate culture landscape in 2019, you’ve got a little bit of everything. You’ve got the way things used to be, where you show up to work, put in your eight hours, and go home. You’ve got the new-school office, with bean bags and ping-pong tables. And, you’ve got everything in between. Deciding what you want your company’s culture to be is a big decision. It will inform how your employees interact with one another. If you’re a new company, moving forward with a company style is easy. If you’re an established company, however, it can be much more difficult to make this change. Let’s look at seven ways that you can improve the culture at your existing company. One of the biggest reasons that you’ll need to give your company culture a makeover is because your values are stale with your employees. Re-assess what core company values mean to you and give them an update. What we mean by figuring out the “core company values” is what you’re all working towards. If all of your employees know what the purpose of your business is and what they’re all showing up to work towards every day, then they’ll be able to point to something and say, “this is what we’re all trying to accomplish”. You can take inspiration from other successful companies. Check out Top Work Places, where you’ll see companies like Equinix Inc. in New York or Small Circle in California. You’ll also find that Small Circle is ranked as a Top Workplace, 2 years in a row. They do this by having a great company culture and clear company values. It’s easy for individual jobs to become monotonous, so promoting a common goal can show your employees that it’s good to work together and get familiar with what each other does. More teamwork = better culture. Something you see more and more is companies giving their employees more flexibility. Young people joining the workforce today put a special emphasis on work-life balance. Any company that can provide this to their workers will be a popular one. Employees value companies that care about their mental health and happiness. As we become more aware of what work-related stress does to our mental health, we can see the sheer value of taking some time away from the job. If you’re restructuring your company culture, you could integrate one work from home day per week and see where it goes from there. You want to be flexible, but you also want to keep productivity up. If you notice certain employees abusing this system, you can always scale it back. Encourage the employees to start a social committee to plan team-building events and outings. Improved relations outside of the office can only mean positive change at work. One of the biggest problems with so many companies is that they don’t take the time to get to know one another. 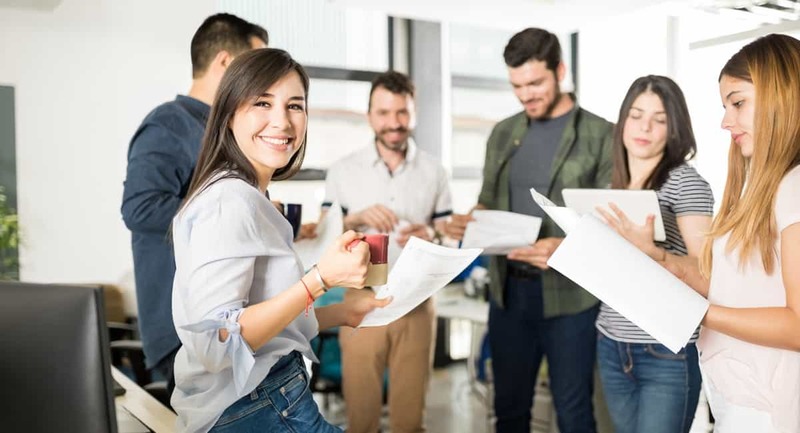 A few company-sponsored team building activities per month will let your employees know that you want them to enjoy working with one another. At many companies, if you want to make changes, you’ve got to go up the ladder. If you want to make a positive impact on the culture and show your employees that you’re listening to them, make your company less hierarchical. If the shipper-receiver wants to suggest something to the CEO, then he or she should be able to do that directly. Things like this create a more open dialogue between employees and eventually everyone will feel comfortable communicating openly with one another. This is a hallmark of great company culture. Similarly, try to avoid any passive-aggressive situations. You don’t want your employees to harbor any resentment toward one another, so if there’s a conflict, you should always encourage that same open dialogue in order to resolve these as quickly as possible. The best thing that you can hope for is for arguments to be out and the open. Your employees should feel free to speak their minds to each other. When they can do this, it’s less likely that ongoing problems will arise. Keep conflicts brief. If an employee has an idea, let them go with it. You don’t want to stifle creativity at your business, you want to promote it. You never know when a great idea might come up and take your company to another level. You also never know who that idea might come from. The most famous example of this is Google’s 20% time policy. They’d let their employees work on whatever they want for 20% of their time at work. You don’t have to model your company culture after this exactly, but if someone’s got a good idea, let them run with it. They’ll love you for it. A great way to move your company into the future is by continually integrating new apps and technology into the fabric of your company. Your culture will benefit from your employees finding new ways to communicate with one another and improve collaboration and unity at work. There are always new apps coming out to increase productivity at work. Things like Slack, Hootsuite, and Toggl let your employees communicate with one another and track progress on certain projects. It’s a great way to streamline things and keep all of your employees in the loop with the goings on at your company. Now that we’ve shown you how to improve company culture, you can start to implement some of these new ideas. It’s never too late to make a positive change at your company. Just by showing your employees that you’re willing to make these changes, you’re improving the culture. Start an open dialogue with your employees today and you’ll see what you can do to improve the culture. From there, you can gradually implement new ideas that will take you into an ever-changing corporate future. Check out our blog for more informative posts on business, technology, and education.